Trade minister Anand Sharma attends the opening plenary session of the World Economic Forum (WEF) India Economic Summit in Mumbai 13 November 2011. Reuters. Mumbai :Trade minister called the country’s recent export data “very disturbing" but said he remained hopeful that the country could meet its target of shipping $300 billion worth of goods for the current fiscal year that ends in March. 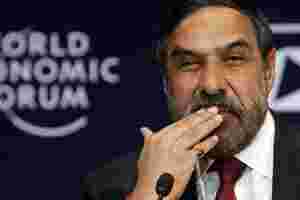 “I remain optimistic but there have been concerns of late," Anand Sharma told Reuters on the sidelines of a World Economic Forum Event in Mumbai. “Last month’s figure is very disturbing," Sharma said. Exports from the start of the fiscal year in April through October totalled $179.8 billion, according to provisional data released on Tuesday, and trade secretary Rahul Khullar said at the time that it would be difficult to hit the full year target. “Some of this was anticipated earlier. That’s why we have been very modest in setting our target," Sharma said on Sunday, referring to the $300 billion figure. “I hope that industry will make a special effort and the government too will work very closely with our exporting community and the manufacturing community to see that we are able to meet our target," he said. Sharma said he had called for a review meeting with the Federation of Indian Export Organisations and the Confederation of Indian Industry.